Richmond, VA-based lawyer Christopher Hill has maintained his Construction Law Musings blog for several years; and contributed effectively to previous Best Construction Blog competitions. This longevity correlates with quality. Blog entries provide useful and relevant legal insights which, while focused in Hill’s market area, are relevant everywhere. 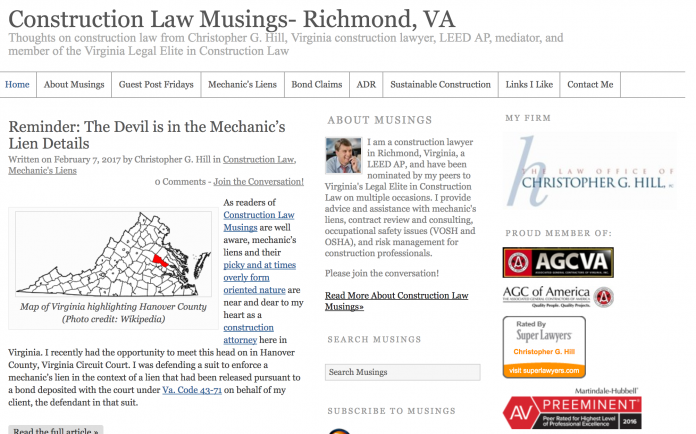 As readers of Construction Law Musings are well aware, mechanic’s liens and their picky and at times overly form oriented nature are near and dear to my heart as a construction attorney here in Virginia. I recently had the opportunity to meet this head on in Hanover County, Virginia Circuit Court. I was defending a suit to enforce a mechanic’s lien in the context of a lien that had been released pursuant to a bond deposited with the court under Va. Code 43-71 on behalf of my client, the defendant in that suit. The case, G.H. Watts Construction, Inc. v. Cornerstone Builders, LLC, involved a memorandum of lien recorded by G. H. Watts without the assistance of an attorney in which the claimant was identified as “G. H. Watts Construction, Inc.” while the signatory on the memorandum of lien and the claimant identified in the notary block were identified as “Gary H. Watts” and “Gary Watts” respectively. Nowhere on the memorandum was Gary Watts’ capacity as it related to the company, nor did it state that Gary Watts was an agent for claimant. In response to the count of the complaint seeking to have the court declare the lien to be valid and thus award the bond to G. H. Watts, Cornerstone filed a demurrer (or in other states, a motion to dismiss), arguing among other things, that the memorandum of lien was not in proper substance or form to meet the requirements of Va. Code 43-4 because it was not properly verified by the claimant G. H. Watts Construction, Inc. and did not properly identify the claimant because Mr. Watts was identified as claimant and not agent for claimant. In short, because the plaintiff failed to identify himself as an agent for the claimant and further personally identified himself as claimant, the memorandum of lien didn’t meet the statute and therefore the plaintiff lost its right to collect on the lien bond. Luckily I was on the prevailing side of this opinion and while the case is not over (there are two other contract related counts remaining) the Court’s opinion further highlights the need to be very careful when preparing a Virginia mechanic’s lien. The smallest missed detail can and will invalidate a lien, costing you a powerful collection tool. These observations indeed prove you shouldn’t take lien (or for that matter, any legal) document details for granted. Construction Law Musings should be a vital bookmark. You can vote for your favourite blogs here. Previous articleIs blogging better than advertising? Next articleVertical or horizontal format for your videos: Which makes the most sense?